All homes currently listed for sale in the zip code 90037 as of 04/18/2019 are shown below. You can change the search criteria at any time by pressing the 'Change Search' button below. "CORNER LOT DEVELOPMENT OPPORTUNITY with RARE R4 ZONING and TIER 3 TOC in pristine location close to USC. 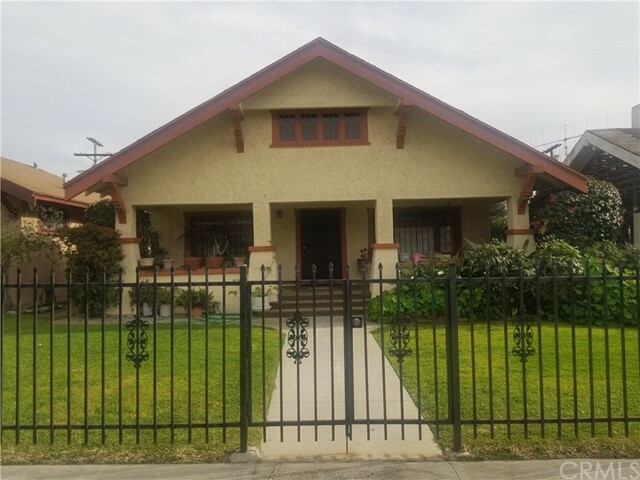 Rare opportunity to acquire a well sought out piece of real estate, located in one of the most up and coming neighborhoods in Los Angeles. Per city, build up to 13 units based on TOC Tier 3. Alley access is accessible for parking in back of property. Being within minutes to freeways, shopping, the metro line, and selection of restaurants adds to the appeal of this already lucrative opportunity." "Investor opportunity zoned R2 property with great potential. Corner lot, double porch, living room with fire place, large dinning room, den, comfortable bedrooms, basement, patio covered yard with small garage for storage or ADU potential. Walking distance to schools, grocery store, Coliseum, USC, Expo Park, Science Center, Natural History Museum, the new Banc of California Stadium (Home to LAFC) and under cosntruction $1 Billion George Lucas Museum of narrative art. Easy access to 110 Fwy as well." 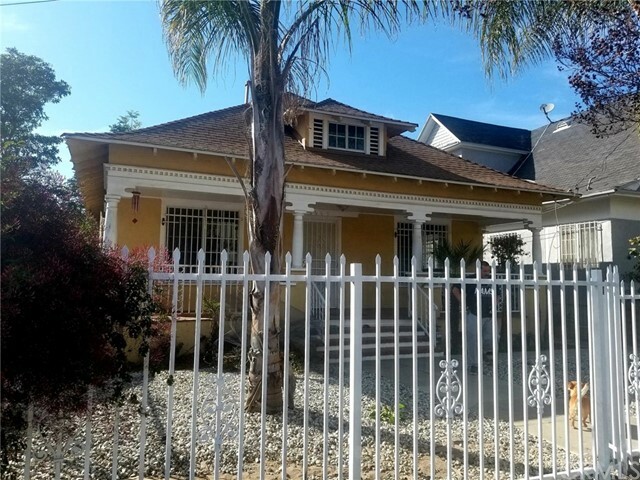 "Opportunity abounds with this four + bedroom home on large 5227 sf lot zoned for two units and within USC Neighborhood Program. Master bedroom and bath recently remodeled with recessed lighting added, new tankless water heater, and updates to the backyard create the perfect setting for entertaining. Just around the corner you have 3 schools, Normandie, Manual Arts, and USC, along with Vermont Square Park. Reach out to make this your next home! Home will be delivered vacant." 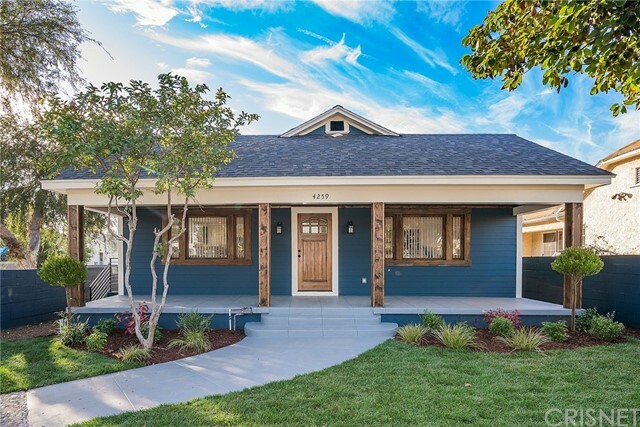 "STRIKING CRAFTSMAN HOME ON A CORNER LOT! EXTENSIVE RENOVATION WITH SPECIAL ATTENTION PLACED ON THE INVITING PORCH ENTRY, TO THE NEW WOOD SIDING AND BOLD EXTERIOR COLORS. UPON ENTERING YOU IMMEDIATELY NOTICE THE AMOUNT OF NATURAL LIGHT THAT FILLS THE ROOM THROUGH THE NEW DOUBLE PANE WINDOWS. LARGE OPEN LIVING ROOM FLOWS EFFORTLESSLY INTO KITCHEN WITH BREAKFAST BAR AND FORMAL LIVING ROOM, MAKING THIS AN ENTERTAINER'S DREAM. 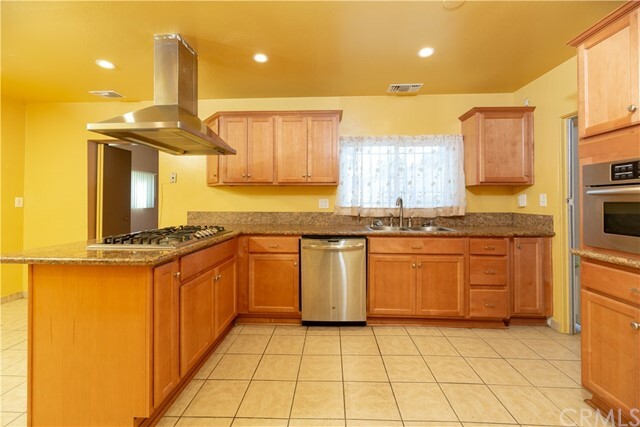 KITCHEN BOASTS NEW CABINETRY, COUNTER TOPS, AND TILE BACK SPLASH. INDOOR LAUNDRY. NEW ELECTRICAL, PLUMBING AND CENTRAL HEAT. ALL BEDROOMS ARE AMPLE IN SIZE WITH GLASS CLOSET DOORS, CUSTOM WINDOW COVERINGS, AND LAMINATE FLOORS THROUGHOUT. BATHROOMS COMPLETELY REDONE. MASTER BEDROOM HAS SLIDING DOOR ACCESS TO BACK YARD WITH TONS OF PARKING, ROOM TO PLANT TREES FOR SHADE. BLOCK WALL ALL AROUND WITH NEW GATE. FRONT YARD IS FRESHLY LANDSCAPED. WITHIN MILES FROM RAMS, COLISEUM, USC, MUSEUMS AND EXPOSITION PARK. NOT TO MENTION 10, 110 AND 101 FREEWAYS. ALL WORK DONE WITH PERMITS. START OUT SPRING IN THIS FRESH CHARMER!" "WOW, take a look at this completely remolded sweet craft-man home! This charm offers you 3 bedrooms 2 bathrooms and will blow you away with its open floor modern concept! As you enter the spacious living room with recessed lighting, you'll notice the cozy fireplace. Wake up each morning to a new illuminated kitchen with new quartz counter tops and a smell of warm coffee... As you enter the hallways you meet face to face with the matching features of the bathrooms that compliment the theme of the entire home!! Brand new central AC and Heating system, energy efficient appliances, etc. This home has way too many outdoor and indoor finishes to mention on here so simply come take a look at this one of a kind beauty before its GONE!" "Great location, walking distance to the Coliseum, University of Southern California and within a short driving distance of downtown Los Angeles, 3 bedrooms, 1 bathroom, hardwood floors, newer kitchen cabinets with granite counter tops, dining room, wood burning fireplace in living room, plenty of fruit trees in the back yard, one car garage and a driveway with possibility for parking for at least two more cars in the rear." "STANDARDAS-IS SALE - Property profile shows 3 bedrooms, there are 4 bedrooms. This wonderful home has been well maintained by the same homeowner for over 47 years. You will immediately notice the care that has been rendered upon entering the front door. You'll be impressed by the spacious rooms, the living room boast great lighting, offers a fireplace that burns either wood or gas. There is forced air/heating, copper plumbing throughout, updated electrical panel, updated kitchen with granite and stainless dishwasher, hood, built-in microwave, both bathrooms have been updated, brand new carpet, recessed lighting in several rooms, laundry room with washer/dryer hookups recently updated, double pane windows throughout, water softener. Drought resistant lawn in the front yard. The garage has been converted to a bonus room and is insulated & wired with surround sound & recessed lights. The home is wired with a security system that will remain, there is also a 15 X 20 Tuff Shed that will remain. The size of the home from the outside is quite deceiving." "Opportunity to own 2 large units on one lot. Near USC,close to shopping, major areas of interest. Priced to sell! This duplex sits on a 5,100 sqft lot! Units are in need of some TLC, but have had some work done, such as carpets and paint. Some original features remain for those who love authentic charm. Perfect for a buyer looking to have instant equity while renovating, live in one unit and rent the other. 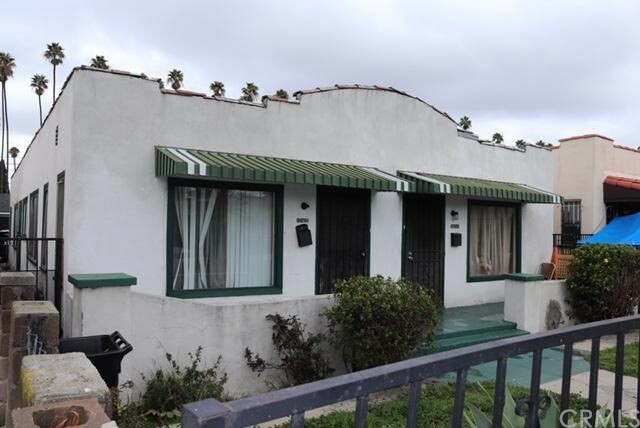 Also great for an investor looking for units in the greater area of Los Angeles. Both units have 2 beds/ 1 bath with rear parking for up to 5 cars with an electric gate. Total building sqft is almost 2240. Property sold in as is condition." 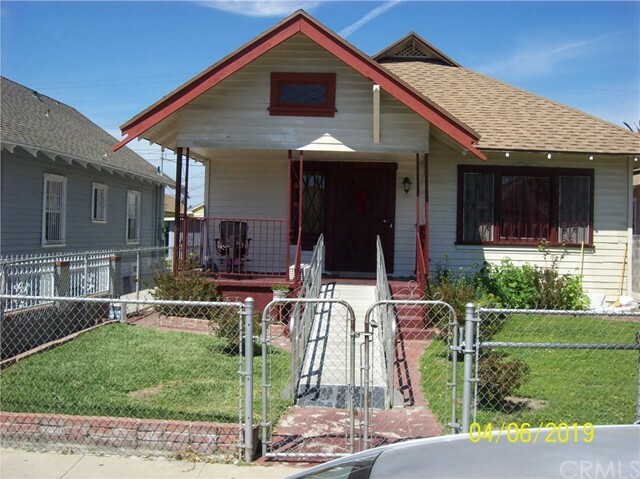 "3 bed 1 bath, great opportunity for an investor or family to own a home in a great area." "Welcome Home to this Buyer's Dream! 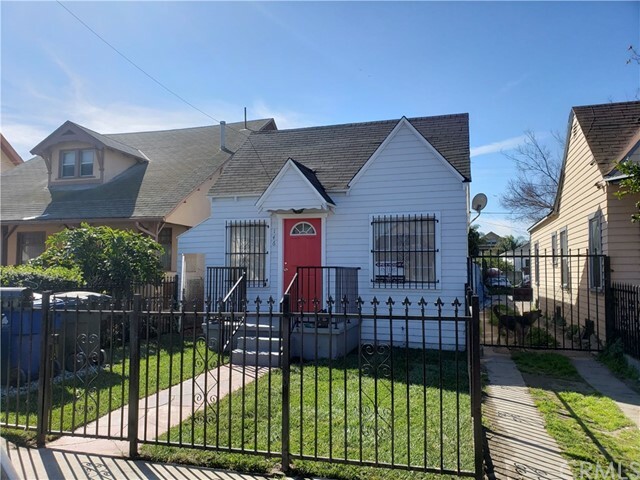 A completely rehabbed and turn key project with 4 large bedrooms, 2 baths, a contemporary open floor plan awaiting a buyer that can embrace all the new features that a true home has to offer by all standards!! Sitting on an R2 Zoned lot with lots of potentials like adding another back house behind it, this home offers brand new flooring all through the home, new bathrooms, new kitchen, new windows and doors, new lighting fixtures, new cabinets and closet, new paint, new stove, new dishwasher, new microwave, plus washer and dryer hookups in the two car garage, what more can you ask for!! Grab the keys and start living!! This will not last, bring you best offer and let's go to escrow!!!!" "Bring your paint brushes and come make this home your own! Near all amenities and downtown LA. One of the few homes in the area with a backyard and alley accessible. This home is perfect for the family that is looking to make it their own and not afraid to put some love and work into it." 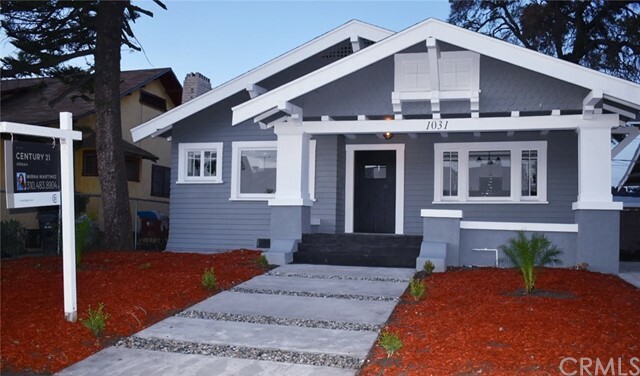 "Stunning two story Craftsman on a corner lot with great potential. Property is located near USC and exposition park. Property features 3 bedrooms and 1 1/2 bathrooms with approximately 1340 square feet. 1 bedroom downstairs and 2 upstairs. Detached garage. Large front porch"
"Fixer near USC....probate that may need confirmation [not likely]. 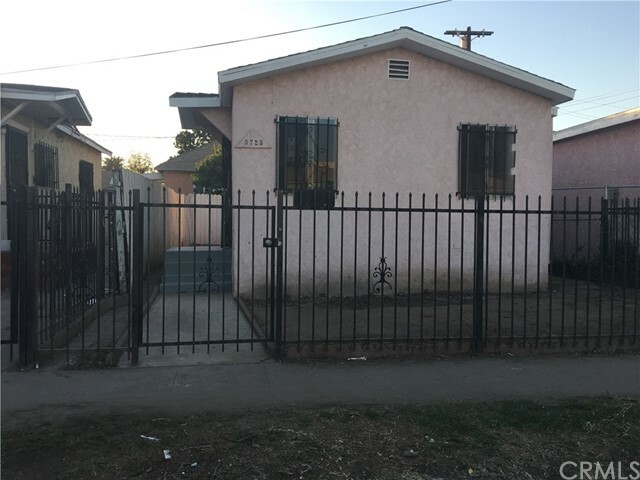 A loan on this property would be unlikely in it's current state"
"SPACIOUS 3 BEDROOM, 2 FULL BATHROOM HOME WITH OPEN FLOOR PLAN, FORMAL DINING ROOM, OPEN UPGRADED KITCHEN, LIVING ROOM & INSIDE LAUNDRY ROOM. LARD2 ZONED. 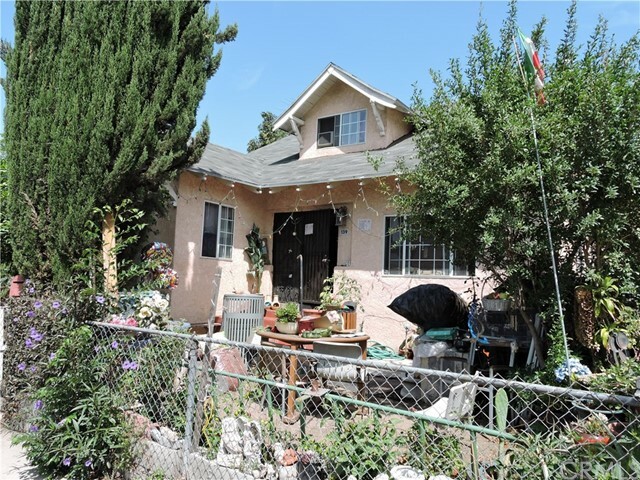 LOCATED IN A NICE LOS ANGELES AREA.PROBATE SALE WITHOUT REQUIRED COURT CONFIRMATION. SEE ABOVE MLS SUPPLEMENTS FOR CERTIFICATE OF OCCUPANCY PERMIT FOR 1 BEDROOM & 1 BATHROOM ADDITON. PROPERTY PROFILE SHOWS 2 BEDRMS, 1 BATH. BUYER & BUYER'S AGENT ARE RESPONSIBLE FOR VERIYING ALL EXISTING BUILDING PERMITS AND SQUARE FOOTAGE. ALL CASH PURCHASE ONLY. GARAGE HAS EXTENSIVE DEFERRED MAINTENANCE. EXCELLENT INVESTMENT OPPORTUNITY FOR A BUILDER, INVESTOR & AN ALL CASH BUYER THAT WANTS TO MAXIMIZE THE HOME'S POTENTIAL. THIS HOME HAS TREMENDOUS INVESTMENT POTENTIAL FOR A BUYER WITH VISION THAT IS SEEKING AN INVESTMENT WITH AN UPSIDE PROJECTION. CLOSE TO CHURCHES, 110 FREEWAY, SCHOOLS, USC, COLLEGES, PARKS, PUBLIC TRANSPORTATION & SHOPPING. BUYER SHALL SUBMIT OFFER ON PROBATE PURCHASE AGREEMENT FORM PPA ALONG WITH BUYER SIGNED ANY AND ALL CONTINGENCY REMOVAL FORM, WITH ANY AND ALL CONTINGENCIES REMOVED PRIOR TO ALL CASH OFFER BEING PRESENTED TO AND ACCEPTED BY PROBATE ADMINISTRATORS...PROPERTY IS BEING SOLD AS IS IN PRESENT CONDITION WITHOUT ANY WARRANTIES, EXPRESSED OR IMPLIED. SELLERS' CHOICE OF ALL SERVICES . NO BLIND PURCHASE OFFERS WILL BE RESPONDED TO. FOR ENTITY PURCHASES PLEASE SUBMIT CORPORATION OR LLC DOCUMENTS & SIGNED RESOLUTION SIGNED BY OFFICER OR MANAGER WITH PURCHASE OFFER. *PLEASE READ ENTIRE AGENT REMARKS*"
"MOTIVATED SELLER, BRING ALL OFFERS! FHA, VA, NACA welcome! Newly remodeled single family in the heart of it all. New wood-inspired laminate floors, new paint, newer electrical remodeled kitchens (quartz counter, porcelain floors, recessed lights and more) and updated bathroom new ceramic tiles, new paint and more). Large/private backyard with parking access! front yard and more. You cant for wrong with this home. Minutes drive to Exposition Park, LA Coliseum, Banc of California, USC, DTLA and major public transit. Close to the 110, 10, 105 and other major roads. This is a must-see, the seller is motivated and looking at offers asap! This property come with an easement through neighbors allowing access to surface parking in the backyard." "Move-in ready. First-floor corner unit with only one shared wall, high ceiling, light and bright. Excellent floor plan, remolded kitchen with eating area. Newer wood floor throughout, ceiling fans. New air condition unit in the bedroom. Amenities include a full gym, laundry facilitates on site, central courtyard, security gated building and parking lots, 12-hours night times security guard, elevator. HOA includes security, gas, water, trash, and maintenance. 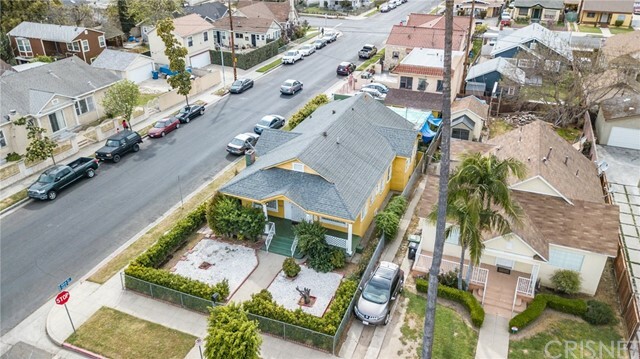 Unique urban location, walking distance to USC, LA Memorial Coliseum, and Banc of California Stadium. Close to Trader Joe's, and the Expo Line at USC, 110 FWY, metro, downtown Los Angeles, Disney Concert Hall, Nokia Theater, Fashion Institute, museums and more." "Remodeled home, new electrical, and full copper plumbing through out. Home is currently used as a 2 bedroom 1 bath."